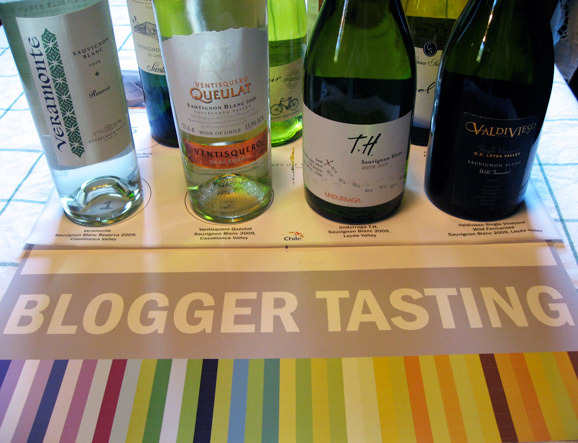 In a few hours (4 o’clock local Hollywood time, to be exact) We’ll be logging on to a “virtual tasting” with Wines of Chile. There will be a panel of 8 winemakers taking questions from wine bloggers throughout the US, via video conference, or something. They sent Us a bunch of wine in a colorfully taped box with great packaging and marketing materials. Very excited. Is it 4 o’clock yet? Post all that Chile slurping, We’re heading to the SLS Hotel/Bazaar in Beverly Hills to taste Spanish wines for Great Match. Our double-date partners, D & M, are joining Us, so cocktails at the swanky lobby lounge, Bar Centro, are likely to follow. All week long there have been a ton of events for Natural Wine Week…We haven’t booked anything yet, but the symposium at LACE sounds awesome. The Taste California Terroir sounds great too and features a couple of our favorite local wine/food spots: DomaineLA and Lou on Vine (it’s been way too long since We’ve seen these folks). The tasting is being held at beautiful Heath Ceramics, which means not only our taste buds, but our eyes too will be tantalized. There are also two great tastings coming up at Pourtal, the sweet little wine bar that actually gets Us to travel to the Westside. A Donkey & a Goat Winery on May 14th and our favorite Wine Chick, Morgan of Cold Heaven on May 20th. But wait! There’s more! The LA Wine Fest is coming up on June 5th & 6th on the back lot of Raleigh Studios. We’ve got a special deal for our readers: buy tickets online and get $15 off with promo code: SACHA. Sweet.